Jenkins knows of Lord Vowchurch, Mrs. Conyers father, both from circulating stories about him, “one of those men oddly prevalent in Victorian times who sought personal power through buffoonery,” and from a caricature by Spy, which had appeared in Vanity Fair and now hung in the billiard-room at the Conyers’ home, Thrubworth [ALM 8/4]. John Constable (1776-1837) was a British painter known for sweeping landscapes of his native Suffolk County, the Salsbury Plain and its famous cathedral, and views of the then-rural outskirts of London. Constable was known for his impasto, paint applied thickly so that brush strokes were visible, which was not a fashionable technique in his day. He paired painstaking attention to directly-observed detail with compositions that revealed his belief in a Nature endowed with sentiment. Hence, he is identified as a Romantic painter, akin to his contemporary J. M. W. Turner. While Constable’s work met with consistent critical esteem within his own lifetime, he struggled for commercial success and had to resort to commissioned portraits of affluent sitters in order to support his family. Portraits of great houses were not common in Constable’s output, and the Constable Dogdene in the National Gallery is an invention of Powell’s, as is Dogdene itself. Constable favored landscapes into which picturesque cottages or humble farmsteads were nestled, rather than those surrounding pretentious mansions. Nevertheless, at least two or three paintings by Constable of Malvern Hall in Warwickshire exist, and suggest the sort of scene Nick has in mind when he remembers Dogdene. The one shown here dates from 1809 and is now in the collection of the Tate Museum. Paolo Veronese’s (1528-1588) greatest commissions were for clients throughout the Veneto, but he is most readily identified with his huge Venetian paintings of Biblical and classical mythological and historical scenes (see Alexander receiving the Children of Darius after the Battle of Issus in QU). Veronese took inspiration from the high Renaissance schools of both Titian and Raphael and emerged with a synthesis that is now usually dubbed Mannerism, alluding to a kind of exaggeration of qualities that take his paintings somewhere beyond the simpler naturalism that his forbears aspired to. Later in Dance [HSH 209/225] the Dogdene Veronese is identified as Iphigenia. There is not a known Veronese Iphigenia, so we show this allegory called Infidelity, which seems appropriate to the tone of ALM. Oil on paper laid down on wood; 15 5/8 x 19 1/2 in. 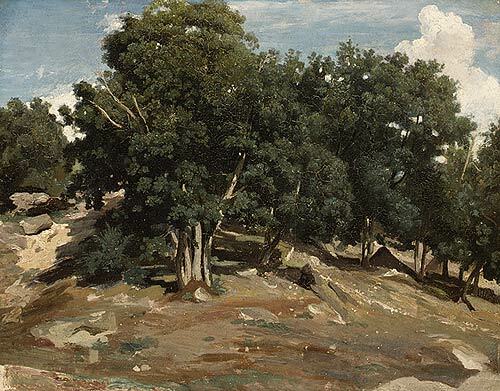 The ‘Barbizon school‘ refers to a group of French nineteenth century landscape painters, including Jean-Francois Millet, Theodore Rousseau, and Camille Corot, who painted realistically from nature, working outdoors in the Forest of Fontainbleau, and often meeting in the nearby village of Barbizon. Their work departed from the neoclassical landscapes of Poussin and Claude Lorraine. Among their inspirations was Constable’s exhibit at the Paris Salon of 1824. Richard Wilson (1714-1782) was a Welsh-born painter, one of the earliest British landscape painters and well-known for his idealized bucolic scenes in the tradition of Claude Lorrain. Wilson became a founding member of the Royal Academy. Pictured here is his view of the Thames at Twickenham from 1762. We have interspersed a Moroccan pastel of a courtyard in Marrakech, painted contemporary to the setting of ALM, to highlight the eclectic nature of the Jeavon’s collection. Jean Baptiste Greuze (1725-1805) was a French painter who aspired to be known for his historical compositions but whose fame was primarily based on masterful “genre scenes,” riveting melodramas of bourgeois domestic life that embody moral lessons. In spite of his vexed relationship with the French Royal Academy regarding the status of such subject matter in the traditional hierarchy of painting subjects, Greuze was immensely popular with a bourgeois audience during his own lifetime. By the time of his death, however, Greuze’s reputation had fallen precipitously, due to the sentimental nature of his domestic scenes, but in most recent times a renewed esteem for his draughtsmanship and formal mastery have kept his name in currency. We aren’t told which Greuze hung in the Jeavons’s drawing room, but here is his “Village Wedding,” of 1761, now in the Louvre. When Dutch painting flourished in the seventeenth century, painters commonly devoted themselves to scenes of everyday life, called genre paintings. Maybe Nick was thinking of something like this cellist in a painting by Adriaen van Ostade (1610-1685). 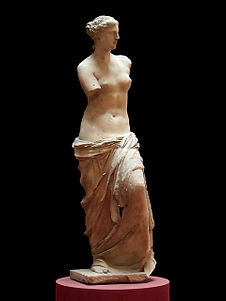 We have already seen how Quiggins thought contemporary sculptors might treat statuesque Mona. Now Jenkins is clearly not referring to the classic Venus de Milo but looking toward later visions of the goddess of love. Thomas Lawrence (1769-1830) was a portrait painter and president of the Royal Academy. His flattering portraits were in demand by the artistocracy. This portrait by Lawrence shows the Third Marquess of Londonderry in a hussar’s uniform. A very similar portrait, dated 1814, is in the National Gallery in London on loan from the executors of the late 9th Marquess of Londonderry. Lawrence charged more for more complex paintings, so the full-length portrayal and the detail of the hussar’s uniform showed the affluence or at least the extravagance of the Erridge’s ancestor. The Paris School alludes not so much to a style of art but to Paris’ role as the magnet for forward-thinking artists of every stripe during the first part of the 20th century, up until World War II. In the period before World War I, which would be when Lady Molly was coming of age as the mistress of Dogdene, the Paris School would have included Picasso and Miro among its painters, Brancusi and Modigliani among its sculptors. It is Lady Molly’s immunity to so many new strains of art — Cubism, Surrealism, the magical realism of Chagall, the expressionism of Soutine, the elongated figures of Modigliani — that signals her lack of enthusiasm for art, despite the Wilson and Greuze on her walls. We could show any number of the diverse output of the School of Paris, but we have chosen here an artist not actually mentioned in Dance. The Celtic Twilight refers to a renaissance of Irish literature focused on a revival of interest in Gaelic folklore and Irish nationalism at the end of the 19th century. The name itself derives from William Butler Yeats’ 1893 collection of tales and poems entitled “The Celtic Twilight.” The Celtic Twilight also inspired a number of visual artists and an increased interest in older designs like the Celtic cross. Jenkins is not alone in disparaging this movement; in Finnegan’s Wake, James Joyce wrote of the “cultic twalette,” but it should be remarked that its luminaries include not only Yeats but Sean O’Casey, John Millington Synge, and George Bernard Shaw. A snaffle is a common type of horse bit. ‘Snaffles’ was Charles Johnson Payne (1884-1967), who worked as a graphic artist during World War I but after the war, concentrated on prints of sports: hunting, polo, fishing, pig-sticking in India, racing. The example shown below, from a Lawrences Auctioneers catalog, shows some of Snaffles characteristics, like a penciled signature and a humorous caption. An impressed mark of a pair of interlocking snaffles, often part of his print borders, is reportedly present, but we cannot see it on this reproduction. oil on canvas, 76 x 32 in. 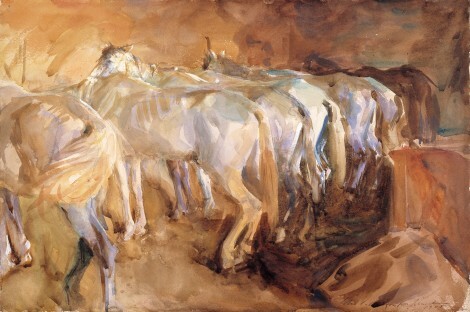 John Singer Sargent (1856-1925) was prolific, producing over 900 oils, over 2000 watercolors, and numerous drawings. He was born in Florence to American parents, studied in Paris, and spent much of his life painting in London. His portraits of the rich and famous were in demand on both sides of the Atlantic. This portrait of one of his patrons, Isabella Stewart Gardner, showed so much flesh that her husband asked her not to display it publicly while he was alive. We have highlighted a watercolor of horses to show how his elegant realism contrasted with Snaffles’ jocularity. 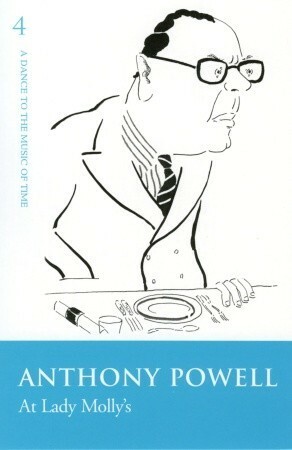 Umfraville’s mot is the only mention of the Sargent in Dance, so we know nothing of Powell’s opinion of him. Rodin called him “the Van Dyck of our time;” (John Singer Sargent: The Early Portraits, 1998, p 150), but others preferred the Modernism that figures so prominently in Dance rather than Sargent’s realism. Roger Fry called the work “wonderful indeed, but most wonderful that this wonderful performance should ever have been confused with that of an artist.” Ivan Kenneally, writing for an exhibit of Sargent watercolors at the Museum of Fine Arts, Boston, examines Sargent’s relation to Modernism and puts Fry’s put down to rest. Samuel Pepys (1633-1703) was an administrator of the Royal Navy and a member of Parliament during the reigns of Charles II and James II. He is famous for the diary that he wrote from 1660 to 1669, first published in 1825, in which he gives a vivid account not only of his personal affairs but of the whole of London during the Restoration. Powell was fascinated by this period of English history and wrote a book on John Aubrey, who like Pepys, is a major source on the intellectual and social history of the period. Aubrey and Pepys were well acquainted; both belonged to the Rota club, a London debating society. Pepys is dour enough in his portrait, but our vision of Widermerpool is also informed by this caricature drawn by Mark Boxer, which appears on the cover of the Flamingo edition (1984) of ALM. General Conyers is referring to a painting by Cornelis Troost (Dutch 1697-1750). Troost was one of the foremost Dutch painters of the eighteenth century. Living his entire life in Amsterdam, many of his early commissions were portraits. We show a portrait with a cello to honor General Conyers’ affinity for this instrument. Later Troost painted theater scenes and, during the 1740’s, many military subjects.